Kia ora, welcome to Wanaka and Mountain View Backpackers. We are a classic kiwi homely style backpackers in an old home with 29 beds. 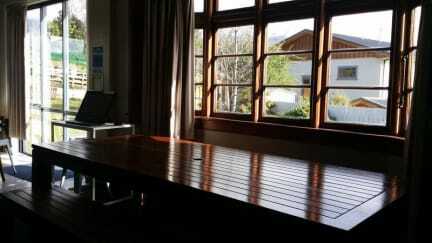 We are centrally located in the heart of Wanaka and just a few minutes walk to the shores of lake and 'That Wanaka Tree'! We pride ourselves in offering you a clean hostel and friendly service. Close to the supermarket, Paradiso movie theater, and DOC office. We are a perfect location that is in town but not in the main street of town and have a large sheltered garden for relaxing in. Off street parking, 1 GB WiFi free per day, free BBQ, hairdryers, wine glasses, coffee plungers, Backpacker phone and computer in the common area. Lockers in all rooms, and extra lockers in the hallway. Gear storage if you arrive early. We love having adventurers stay; cycle tourers, Te Araroa trail walkers, Mountain climbers, skiers, snowboarders. We are adventure people who seek adventure minded folk. Mt View changed ownership and management in September 2016. We are loving restoring this beautiful old home and replacing things and making it a better experience for the traveller. Lots of new things... :) Lockable lockers in all rooms and usb plugs. 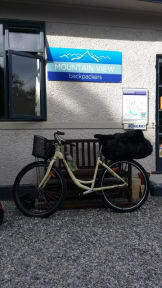 Mountain View Backpackers is a sociable hostel that makes an ideal alternative to the larger commercial chains. I could not have asked for a better stay or lodge manager, I think her name was Cecile. She was very accommodating and always had a smile on her face. She even found time to play me a song on the ukulele. Though her singing was only 4 stars I give her gratitude 10 stars. My friend is an idiot and forgot to make me a reservation at the cinema so Cecile was kind enough to call them for me. There’s no where else in the world I would rather stay than Mtn View backpacker and Cecile is all to thank. A really great hostel, I would definitely recommend it. Fantastic location, great atmosphere and a good place to meet fellow backpackers. The kitchen was nice and clean, and the sitting room with films and games was good as well. It lacked lights and sockets at each bed, but was otherwise was a fantastic hostel and I would stay there again. Great place, friendly staff and a nice chilled out environment. Only downfall I would say is a weird smell coming from the drains in the bathrooms and shower rooms also a very strong smell of gas outside. But otherwise, great backpackers! The hostel was lovely and clean. The common areas really nice and good set up. Rooms were a bit on the smaller side but still nice rooms. Found one staff member slightly unfriendly, one incident where she barged through me in a doorway. Great hostel with homey feel, would recommend for anyone staying in Wanaka! It can be a nice short term stay. But I was a little dissapointed with the kitchen. There is no basic cooking stuff/coffee/tea in the kitchen compared to many other hostels you will come across in NZ. Also internet consumption is limited. I didn't see this limit in other hostels. I stayed in 6 bed mixed dorm which was nice, clean and had lockers. Both bathroom and kitchen were clean. They also have a big garden which was really nice. The hostel itself was really nice, small and cozy. I felt like a home there though the office manager wasn’t very friendly or welcoming. Cleaners were really nice though! Such nice staff and a good community of people. The rooms and facilities are simple but clean. Nice enough place but felt didn't feel very warm or welcoming...not somewhere we really wanted to hang out. Super strict on checkout time and makes you take all the sheets off and bring them to the front for them. A bit too pricey for what you get.